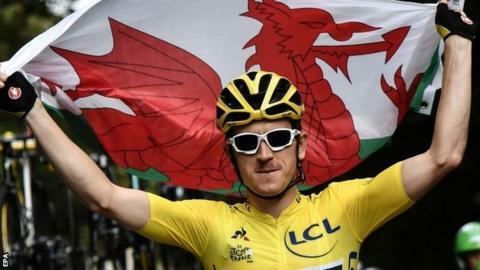 Geraint Thomas became Britain's third winner of the Tour de France when he crossed the finish line in Paris. Alexander Kristoff won the sprint finish on the Champs-Elysees as Thomas crossed the line arm-in-arm with Froome in the middle of the peloton. Welshman Thomas, who rode in support of Froome in each of his wins, had built up that lead over the previous 20 stages and Tour convention dictates that the yellow jersey is not challenged on the final stage. Froome was heavy favourite to become the fifth rider to win a record-equalling fifth Tour de France title. He came into the race as defending champion and holder of all three Grand Tour titles, having won the Vuelta a Espana last September and the Giro d'Italia in May. But his hopes of also matching Eddy Merckx's record of four consecutive Grand Tour victories were ended in the Pyrenees mountains in the final week as Thomas proved the strongest rider. The final 116km stage began in Houilles, to the north-west of Paris, and the riders took a leisurely pace into the capital before embarking on eight laps of the centre. Team Sky led the peloton into Paris, having allowed France's Sylvain Chavanel to ride clear for one lap in his final Tour in recognition of his achievement of completing a record 18th Tour. Six riders built an advantage of about 45 seconds as the laps ticked down but they were eventually reeled in on the final lap, with 6km remaining. World champion Peter Sagan's Bora-Hansgrohe team-mates did the bulk of the chasing, but Norwegian Kristoff outsprinted Frenchman Arnaud Demare and Germany's John Degenkolb. Thomas' victory comes in his ninth Tour, one fewer than the record for most appearances before winning, held by 1980 winner Joop Zoetemelk of the Netherlands. His sacrifice in helping Froome win four Tours has meant Thomas' best finish before this year was 15th. This year, he has ridden a near faultless race to cement his place among Britain's greatest cyclists.